1. What item is the most numerous result from on ebay search “Montgomery, Vermont"
2. According to the latest census estimates over 34% of Vermonters 25 years old or older had attained a Bachelors or higher degree. How many living in Montgomery have a Bachelors degree or higher? What is missing from this photo of a section of Pratt Hall's west wall? The correct answer is g. All of the above. This picture shows what was once a five way junction of timbers. The rotted portions have been cut out and a scarf joint cut for the new tie beam piece. Other timbers will get scarf joints or new mortises and tenons. These new joints will be reinforced with some steel, and laminated beams where needed. We ended up having to repair/restore four of these sites, rather than the three we anticipated. 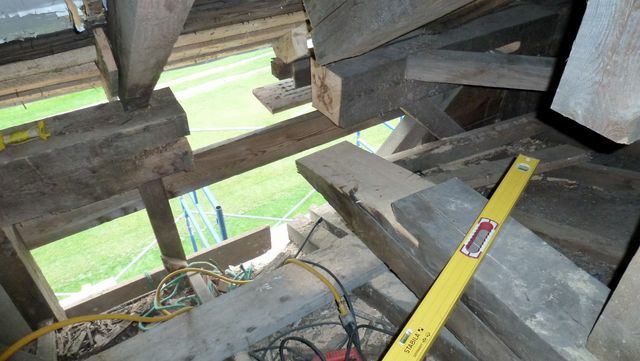 The rot was likely caused by leaks in the roof, one of which dated to the 1890s, or before, based on the cut nails used in a previous repair. Moisture attracts bugs, fungi, and other bad things. Member Sandy Bowman recalls being in the Hall in the early 70s during a rain storm and seeing water run down the inside of the wall. The Board at that time decided the first thing they had to do was install a new roof. Amen! As I write this, most of the structural work at the top of the west wall and in the attic is done and the building is being buttoned up. The moldings and decorative pieces comprising the soffit and fascia are being installed and the exterior scaffolding will be coming down soon. Work on two of the stained glass windows has also been completed. More pictures of the project can be seen from our home page. We update them at least weekly. Still to come is the work on the sill and foundation outside, and plaster and painting the ceiling inside. When that work is done the windows will be re-installed. So far everything is on schedule and budget. Additional details and pictures follow. This project has consumed much of our time and effort since starting in late July so this newsletter may be a bit short. We couldn't have done this without the great financial support from our members and others interested in our work. Your encouragement has lifted our spirits and we are all smiles. Thank you! 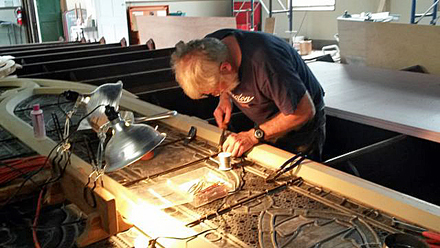 Jan Lewandoski, our timber framer and general contractor has been in contact with Leonard Spencer, the plasterer and painter of the Hall's ceiling back in the70s. He remembers the project fondly and confirmed his assessment that the blue beauty is historically accurate. A larger piece of the ceiling will need to be cutout, lath installed and then the plaster patch and painting. 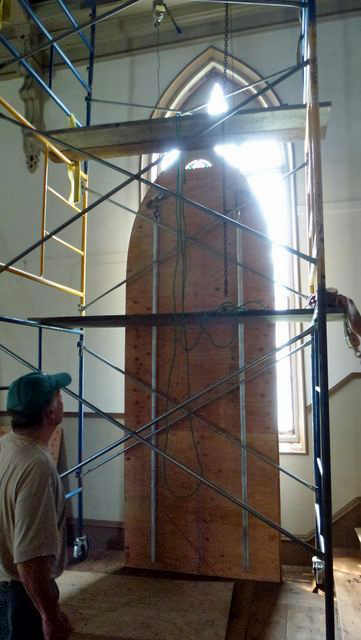 We hope to have him assess the rest of the ceiling while he's here to see if there is any other work needed. There are cosmetic cracks and some stains from leaks that we may want to address. 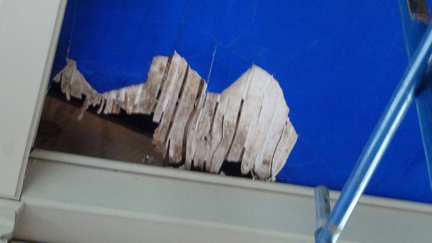 Small spot of ceiling damaged by structural work. While the stained glass windows are out we've decided to do some light restoration. This has included epoxy repairs to the wooden window frames, priming and painting the exterior, and tightening and installing additional copper wire ties which help distribute the weight of the glass panels to steel frame bars. We may plane the frames a bit to allow for easier re-installation and minimize any impact from normal expansion and contraction. Larry Ribbecke solders new copper tie wires. Marijke Dollois reports our membership is a tad shy of our annual 200 member goal. About 125 reminders were sent out in September. If you've already renewed, thanks, if not please renew if you can. There's always room for more so tell your friends and invite them to join too. 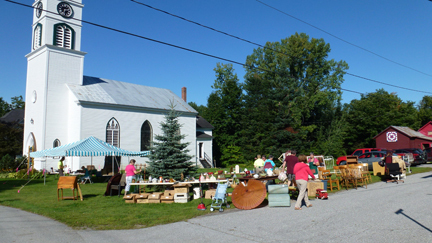 This year's Open House also included a "Uniques Sale", 3rd Edition book signing, tours, and Quilt Raffle ticket sales. Our thanks to all those who donated items, to Joe Sherman and Jo Anne Bennett for signing a bunch of copies, and to surprise signer Bill Branthoover, co-author of the original edition, visiting from his home in Ohio. 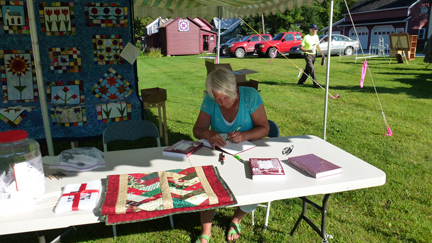 Jo Anne signs a copy of "Montgomery Vermont: The History of a Town" 3rd Edition. 1. b. Montgomery School House toys are the most numerous result on the ebay query "Montgomery, Vermont. Clayton Fuller Real Photo postcards are a close second. The Society has partnered with the Town Library, and The Friends of the Library, to sponsor a presentation on "Vermont in the Civil War" by historian Howard Coffin on Oct 8th. Author of several books about Vermonters' involvement, he's an award winning writer and great speaker. This is free and open to the public at the Town Hall starting at 7:00 p.m. Don't miss it. This is part of the Vermont Humanities Council speakers program. On October 19, 1864 Sheridan's victory at the Battle of Cedar Creek ended the Confederate Army threat to Washington and bolstered the re-election of Abraham Lincoln. Vermont men played a pivotal role. About 45 Montgomery men were in units present at Cedar Creek. Two were wounded and one taken prisoner. 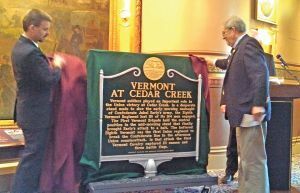 From vtdigger.com written by VT Sen. Joe Benning: "On Sunday, October 19th, 2014 at 11:30am, a monument honoring Vermont’s Civil War troops will be unveiled during the Cedar Creek battle’s 150th anniversary ceremony. The monument consists of a Vermont roadside historical marker (the green and gold sign below) and a display sign which will be at the base of it. The display sign will have a reproduction of the Julian Scott painting that now dominates the Cedar Creek room at the statehouse. It will also speak of Vermont’s role in the battle. This monument was approved by Vermont’s legislature as part of our celebration of the Civil War’s sesquicentennial. The unveiling will take place in the middle of the 150th anniversary’s battle re-enactment, hosted by the Cedar Creek Battlefield Foundation. It is one of the few re-enactments that takes place on an actual battlefield. Thousands of re-enactors are expected to attend, including many Vermonters. The commander of the Union forces is assembling a formal march-by and battalion salute when the monument is unveiled. Dignitaries from Vermont and Virginia have been invited although we don’t know who will show up at this point, I and author Howard Coffin will present some words. The ceremony’s location is on Route 11, locally known as the “Valley Pike,” in Middletown, Virginia." Rosalia LaBier was thrilled to win the "Montgomery Flower Garden" raffle quilt donated by the Franklin County Quilters Guild (her screams of joy almost led to 911 calls!). Nancy Tavares won the quilted table runner, "Holiday Braid" donated by Sharon Perry, and Hannah Sorenson won the set of Covered Bridges embroidery patterns designed and donated by Denise Chase and Sharon Perry. This was the last official fund raiser for the West Wall Capital Campaign (WWCC) . Thanks to all for the donations and to all of you who bought tickets. We wish we had quilts for all of you. This year's LLHS Annual Meeting is in Brattleboro on October 31. The theme is "Mission and Creativity: Making Your Organization Thrive". These are open to the public and members of local Societies get discounted registration. You can get more info at http://vermonthistory.org/community/league-of-local-societies-and-museums/league-meeting-2014. We are nominated for two Awards of Excellence this year. One for the West Wall Capital Campaign and the Committee headed by Tim Chapin, and a second for "Montgomery, Vermont: A History of a Town" 3rd Edition and Jo Anne Bennett. Our Society has won 9 of these since 2007 and I'm confident we'll do equally well this year. We've yet to pick a date for a Membership Social or Candles and Carols but hope to have both. Please check the events link on our home page for updates. We'll also send out invitations and emails with details. October 1971 - Montgomery Schoolhouse Toys founded. November 1990 - Veterans' Memorial erected on Town Common and dedicated. December 1959 - Hubert and Caroline Daberer open the Carinthia Inn, formerly the Montgomery Inn and the home of lumber baron C.T. Hall. Now the INN. Room cost $8.50 per day and included two meals.